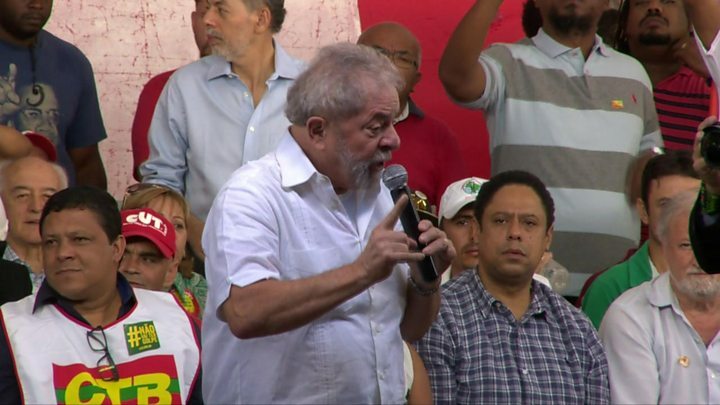 The former Brazilian President, Luiz Inacio Lula da Silva, has given evidence before the country's top anti-corruption judge. He was closely questioned for five hours by Judge Sergio Moro. Lula has rejected allegations that he received a flat as a bribe in a corruption scandal linked to the state oil company, Petrobras. He says the trial is politically motivated and he has denied any wrongdoing. The hearing in a courthouse in the southern city of Curitiba was closed to the public but throughout the day thousands of his supporters gathered in a square nearby. Supporters of the investigation in to the former president gathered elsewhere in Curitiba and in the capital, Brasilia. If Lula is found guilty he faces a prison sentence. If cleared, he has said he will run again for the presidency. This is the first of five charges against him. Who is Luiz Inácio Lula da Silva? Known throughout Brazil simply as Lula, he was Brazil's most popular president during his tenure from 2003 to 2010. A former steel worker turned union leader, he came to office as the first left-wing leader in Brazil in nearly half a century. Why is he in court? Lula is facing five charges related to the Car Wash scandal, the nickname for Brazil's biggest ever corruption probe. This first case, which is being tackled in court on Wednesday, accuses Lula of taking bribes from a construction company that allegedly renovated a beachfront apartment for him. He is also accused of money laundering, influence peddling and obstruction of justice. Lula is typically loved or hated in Brazil. Wednesday will be the first time Lula and the powerful judge in charge of the Car Wash case, Sergio Moro, come face to face in court. Lula says Judge Moro is politically-motivated and believes there is a witch-hunt against him. Mr Moro is expected to hand down his verdict in 45 to 60 days. Magazine covers in Brazil this week depict the face-off in epic style: one shows former President Luiz Inácio Lula da Silva and judge Sergio Moro confronting each other in a boxing ring, raising their gloves and boasting muscular torsos in a montage. Another depicts them fiercely looking each other in the eye in superhero masks, announcing "the first face-to-face confrontation". This gives a taste of the huge expectations surrounding Lula's testimony before Judge Moro. Like a crowd before a boxing match, Brazilians will be split cheering on each contender. Thousands of Lula's supporters are to rally in the city of Curitiba in his defence. Backers of the Car Wash operation will follow closely to see who has the upper hand. But Lula won't be speaking to the judge only. He is the front-runner in next year's presidential elections, and his words will doubtless be measured to convey the right message to voters across the country. Lula could eventually face prison or lose his political rights. But he could still become the next Brazilian president. What happens in the courtroom will help seal his fate.